Melbourne: Volvo Cars is drawing attention to the important - but often overlooked - issue of electric car safety by displaying a Volvo C30 Electric that has undergone a frontal collision test at 64 km/h. Volvo Car Australia has launched the C30 DRIVe onto the Australian market, boasting best-in-class fuel consumption and emissions. The new Volvo C30 will make its debut at next week's Frankfurt motor show alongside the new C70 and S60 Concept. New levels of standard equipment offering improved comfort and convenience for both driver and passenger enhance the Volvo experience with the introduction of its 2009 model range. 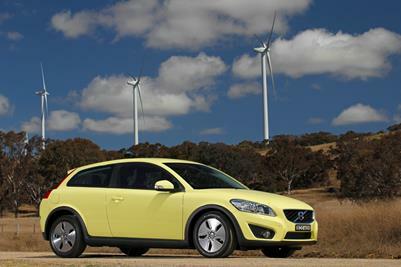 Australian images of the 2007 Volvo C30 are now available, click the thumbnail to view all images. The Volvo C30 has garnered one of the automotive industry's most prestigious awards - the German Das Goldene Lenkrad. This is the third time that Volvo Car Corporation has won this award. The C30 Design Concept is about feeling invigorated by the youth, by the passion and by the dynamics of Volvo's future small car. The C30 Design Project takes a mindful step forward for Volvo into a new premium market segment. Volvo Car unveils the C30 Design Concept as a clear precursor to its future small car - the C30. The C30 Design Concept is a sporty three-door, four-seater. It is not a coupe, as the C classification might imply. MY 2012 Volvo C30 DRIVe.